internet service providers are in Melbourne. There are over two dozen mobile phone service providers in Australia, but most people are on one of the three big carriers: Telstra, Optus, or Vodafone. Telstra was formerly a government entity before going private in three phases from 1997-2006. Thanks to its past it's enjoyed a monopoly on the old telecommunications network and is still considered the best provider today. That also means it's typically the most expensive, though that depends on the device you choose. For example, an iPhone 6s Plus with 128 GB of storage and 1 GB data on Telstra's 4G network will cost at least $84/month and has a 24 month minimum, for a total of $2,040. If you're a data hog, the monthly costs go up to $195. That's not much different than the other major providers. However, an HTC 10 smartphone starts at $81/month, which is significantly more than the others. 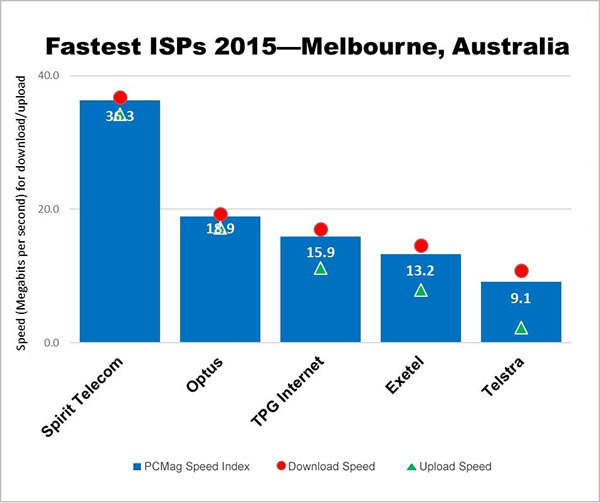 Optus is the second biggest provider and considered the second best network. The iPhone 6s Plus phone and plan reference above will cost $83/month. An HTC 10 is much cheaper than Telstra, starting at $62/month. Vodafone the third largest provider and years ago earned the nickname "Vodafail" for its shoddy coverage. Since that dark time they've invested billions in their network and it is much improved. An iPhone 6s Plus with the same specs is $86/month. An HTC 10 starts at $64/month. If you want to try a network before you get locked in, all providers offer prepaid plans, though you'll need to provide your own device. For a phone contract, you'll need to meet the same 100 point identification criteria as when you open a bank account. With the beginning of the rollout of the government's National Broadband Network (NBN) in 2011, dozens of internet service providers (ISPs) have sprung up, reselling bandwidth on the network. Some of them have just a few thousand customers. For the most part, however, internet service is still dominated by the big guys. The main mobile phone service providers, Telstra and Optus, are prominent players, but there are others, like TPG, that have been around for decades. Spirit Telecom is only available to high-rise apartment buildings and some planned communities, but if you can get it you'll get the fastest internet in the country. It offers unlimited data and has four speeds. Their 25 Mbps plan is $67/month, 50 Mbps is $76/month, 100 Mbps is $96/month, and blazing fast 200 Mbps is $169/month. Optus offers unlimited data for $80/month on a two-year contract, which comes out to a total of $2,045 when you include setup costs. TPG offers unlimited internet with their standard speed of 12Mbps for $50/month. Upgrading to their faster service, which promises download speeds of 50-100Mbps costs $60/month. Exetel offers unlimited data for $55/month on an 18-month contract. Telstra is, as with mobile phones, the most expensive. A 100GB download limit is $75/month on a 24-month contract. Upping the limit to 1,000GB costs $95/month. iSelect - This website has a great comparison tool that asks you a number of questions (such as whether you want to bundle internet with television) and then generates the internet options available at your address, as well as monthly costs.